3 camere da letto + zona a castello, 3. 5 + bagni (posti letto 6-8) tutte le camere con vista sull'acqua. Water Front Home storico costruito dal capitano Nat Herreshoff, yacht designer e costruttore di barche Cinque di Coppa America. Splendidi dintorni con accogliere saloni, tutte con vista sul mare. Portici eccezionale con affaccio Bristol Harbor verso ovest per la visualizzazione di tramonti. Patio Perfetto per rilassarsi cene all'aperto. Comandi Back yard incredibili passaggi di imbarcazioni in Bristol Harbor, grande yacht watching. Tutte le camere sono private e hanno bagni lussuosi e docce. Master suite su un piano, e le altre due camere da letto con bagni al piano separato con un Den e balcone con vista Bristol Harbor. 4000 piedi quadrati di spazio vitale per godersi con la famiglia o trovano un perfetto angolo di leggere, nuotare, rilassarsi e prendere il sole. House ha più livelli. Funziona perfettamente per 2 coppie o piccola famiglia. Magnifica casa sul lungomare con numerosi servizi. Passeggiata in città e godere del borgo marinaro di Bristol con i suoi numerosi bei ristoranti, musei, parchi e luoghi di nozze. Newport è solo a 18 minuti di auto da Bristol dove si può godere di Newport famosa Ocean Drive e palazzi dal epoca d'oro. Bristol è un locale perfetto per una riunione con tante attività disponibili famiglia. Questa casa è a pochi passi da Blithewold Gardens, Mount Hope Farm e Linden Place. Museo Herreshoff Coppa America, si trova dall'altra parte della strada da questa famosa casa. Roger Williams University si trova nelle vicinanze come è Brown University, Salve Regina University e il Naval War College. House si trova Water Front a Narragansett Bay, vela, canoa, nuoto, canottaggio, tutti gli sport d'acqua a portata di mano. Incredibile tramonti. Favolosa cucina con elettrodomestici commerciali e aree di waterfront pranzo. Bellissimi bagni con doccia a vapore, e jet da bagno idromassaggio. Tutte le camere con bagno privato, accompagnati da belle lenzuola. Have been coming to Newport for years and we wanted to stay somewhere cool. We found it. So much history and a view that couldn’t be recreated anywhere in the world. Owner was super nice and was very accommodating. A perfect example of New England Charm. Highly worth the $ . The experience was awesome. Oh let’s not forget the awesome neighbor lady! Super nice and sweet and if you have some people over make sure you invite her. She’s a hoot. Great waterfront location in restored historic home. Property and waterfront location can't be beat. We'll definitely be back! Thank you Vince for the kind review. 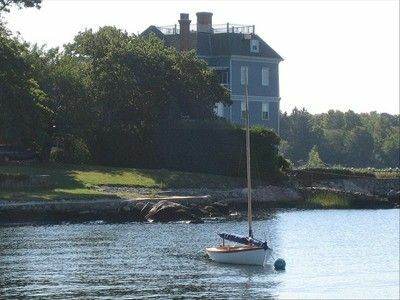 Love Rocks built by Captain Nat Herreshoff is a true classic. I’m so glad you enjoyed your stay and enjoyed Bristol. An absolutely stunning property in a great location with views of the harbor from every room. We loved our stay. The house is beautifully decorated and the bottom floor kitchen is a brilliant location for it. Despite the unseasonably warm temperatures we had during our stay, there was still a good breeze throughout the house and the individual A/C units in the bedrooms made sleeping fine. This is a wonderful house, with a great history. We would most certainly stay again and are already trying to find a time to return. Thank you for your kind review. Indeed it was warm as somehow it always is for the 4th of July in Bristol and soon after the temperature returns to a normal summer day! Thank you again and happy you enjoyed your stay. You are a wonderful family! Nicely appointed with art and antiques, yet very comfortable & clean. Beyond the breath taking views from every window, the highlights are between the mammoth master bath and the ground floor artfully decorated kitchen & dining areas, extending outside to gardens, sea views, & sunsets. Pictures shown do not do it justice. The only negative, and there is no way around accommodating differently, is that because it is a historic multi-level with many stairs, it is not for the handicap guest. Fortunately, for our group, that wasn't an issue, and were able to fully enjoy this wonderful abode located in a little piece of heaven. Carol and her assistant Dot were helpful & accommodating. 'Renaissance City' Providence and 'City by the Sea' Newport are only 20-30 minutes away, if want to venture. Providence has 'the Hill' known for it's outstanding restaurants (Atwells Ave area) , WaterFire (check schedule), Trinity theatre, & College Hill (Brown University). Newport also has great restaurants & shops, Newport Playhouse, mansions and 10 Mile Drive, but can be very touristy. Newport is famous for sailing, where, interestingly, some of the America's Cup race boats that won, were designed by the previous owner of the home you are staying in! The Herreshoff Marine Museum is nearby, if interested, as well as 4 other Bristol museums . Our group decided to enjoy Bristol, but for one day, took the ferry over to Block Island for the day (out of Narragansett where the ferries run later & more often). So pleased you enjoy your stay! Your description of Bristol and the area is perfect ! Thank you. Amazing waterfront property. 320 degrees of water and sailboats. Just like a postcard. Amazing house. Staying in a historic mansion! Most people only get to visit houses like this. Most amazing is the new master bath suite that is as big as a bedroom and has luxurious tub. Great layout with bathrooms with every bedroom. Wonderful dining room with bench seat overlooking water. Cozy upstairs tv room. Kids loved the secret passageway. Great help getting situated late at night with nearby assistance if needed. Bella posizione sul mare con splendidi tramonti e vedute di Narragansett Bay. Passeggiata in città, pista ciclabile breve distanza, le spiagge di Newport Ocean 20 minuti di distanza. From $3800/week Week of July 4th rate is $4000.00 per week. Weekend rental or other time periods other than weekly please call for rates. Dates available:Spring Summer, Fall 2014 is open at this time.